We would like to present our site about the children’s folklore group Javornicek Brno, which is 50 years old and brings together children between 5 and 18 years of age. 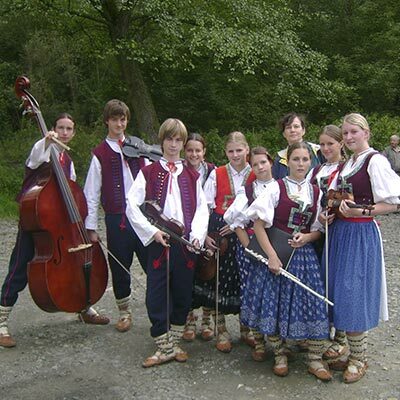 The Children’s Folklore Group Javornicek specializes in dancing, singing and in other ways of performing the folklore from the Walachia and Brno regions using the traditional costumes relevant to the regions. Also, the group has its own music group with all the traditional instruments such as the cimbalom or violin. The group is able to perform almost anywhere – both in the Czech Republic and outside its borders. The repertoire of Javornicek ranges from specific holiday-related performances (e.g. spring welcoming, Easter or Christmas) to combined dance-sing-music performances about the nature, traditional crafts, schooling or audience-engaging fun. As and when required, we can offer many different age groups to perform: 8-10 years old, 10-12, 14-16 and 16-18 years old. The length of each performance can last from 5 to up to 90 minutes. In order to avoid disappointment and ensure the highest quality performance is delivered, it is advised to book no late than two weeks before the required date. Javornicek offers the quality gained from performing on events all around the world. Any other form of co-operation is surely possible. For more information please contact us via email or in person.